Come and play ... everything's A - OK ! 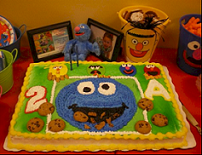 Party Ideas for a Sesame Street birthday. Fun ideas for Sesame Street theme invitations, decorations, games, icebreakers, food, favors and goody / loot bags. Buy or make invitations with the Sesame Street characters on the front. Send out solid color note cards in red, blue and yellow. Find cards that have the shape of the number that the birthday child will be on their birthday. On the inside of the card write "Come and play at _______'s (birthday child's name) party! Brought to you by the letter ___ (first letter of child's name) and the number ____ (age of the birthday child). Print out the Sesame Street sign post and glue onto invitations. Make a large poster to hang on the front door that reads “ _______’s (insert birthday child’s name) Birthday Party brought to you by the Letter ____ (insert first letter of the birthday child’s name) and the Number ____ (insert the birthday child’s age). Hang triangles, squares and circles in bright colors from the trees outside the party venue. Make the entrance look like Sesame Street by making a big sign post with the Sesame Street sign on it. Decorate the party room with large cut outs of numbers and letters made from bright colored poster board. Hang large crayons (like the piggy bank crayons that are over 2 feet long) from the ceiling. Drape blue red and yellow yards of tulle from the ceiling center to the corners of the party room. For the party table decorate in bright primary colors of red, blue and yellow. Solid color tablecloths, flatware and cups look great. If you can find square plates set the table using a square plate, round cup and a napkin folded into a triangle shape. Set out wooden blocks with alphabet and numbers on them for the kids to stack and play with. Use different shaped containers to hold snacks like square bins and round bowls in primary colors. Decorate colored containers or pails with the Sesame Street Characters faces and fill with food or items that are associated with that character. A blue container with Cookie Monster's face could hold chocolate chip cookies, a yellow container with Big Bird's face could hold teddy grahams (for radar), caramel corn (birdseed) yellow chips or cheese puffs, a red container with Elmo's face could hold goldfish crackers (for Dorothy), a green container with Oscar's face could hold "trash" (Chex mix) and a small bathtub shaped container with Ernie's face could hold ice and drinks ... with rubber ducky's floating on the ice. Bake or buy very large cookies and set them out with different colored icings and toppings for the kids to decorate their own cookie. Great toppings are sprinkles, chocolate chips, gummy bears, crunched up candy bars or anything you can think of that kids like to eat. Put the items in bowls with several spoons in each bowl. After they have decorated their cookie take a picture of each child separately taking a big “Cookie Monster” bite out of it. You can then send these with thank you notes to the children after the party. If you are having cake wrap the cookies up in plastic wrap and label them with the child’s name so they can take it home after the party. For extra fun your could find a life size cut out of Cookie Monster or have a large stuffed animal Cookie Monster in the photo with the child. Before the party set out groups of items in the same number that are the age of the birthday child. For example if the birthday child was 4 you would set out groups of four items that are alike around the party area. You could group 4 picture frames together, 4 balls, 4 items that are square, etc. Then ask the kids to go around the room and help The Count find groups of items that count up to the number 4. To play the game have everyone sit together in a circle. The birthday child or "patter" begins and walks around the circle on the outside holding a rubber ducky. They pat the head with the duck of each player as they go around the circle. Each time that they gently pat a player's head they say "rubber duck". Then the one person they choose to be a goose they say "Goose" as they walk by and pat their head. Then the person who called "Goose" runs around the kids on the outside of the circle and races to sit in the place of the one they called Goose. If the Goose tags them they are the patter again. If they run and win the Goose's spot then it's the Goose's turn to become the new patter. Buy a silver metal garbage can with a lid and bang it up a little (you can even add a little black paint to be authentic!) or cover a plastic garbage can with aluminum foil. You can use old water bottles, empty cans or balls of newspaper for “trash” . Have the children line up one right after each other about 5 – 10 feet from the trashcan (depending on age) and ask them to try and throw the “trash” into the trashcan. * Have two trashcans and split the birthday guests into two teams. Have the children each toss one item in the trashcan and then let the next person in line try to throw in an item. Set a time limit ( 30 seconds or 1 minute) and count the items in each teams trashcan. The team with the most items in their trashcan wins. * Play the game as above with two teams but have one person from each team hold the lid to the other team’s trashcan and try to stop the items from going in. * Instead of having the kids throw "trash" into the garbage can have them throw small stuffed Oscar's. Fill a child size bathtub or large white bowl with Styrofoam peanuts (to look like bubbles) and let children toss small rubber ducks into the bathtub. (If your party is during the spring or summer you can do this outside with a baby pool or large plastic tub and real water. Before the party hide lots of foam letters and numbers around the party area. Ask the guests to look around the room and try and find as many of the hidden numbers and letters as they can. Let them search for the hidden items and then after a few minutes have them count the items to see how many each one found. Kids love this game so plan on playing several times. Have older children hide the items for the younger kids or break them into teams and have one team hide the items while the other team finds them and then switch. Snacks and crackers can be placed in colorful buckets or containers with the different Sesame Street character's faces on the front. Cut out sandwiches, brownies, cookies, fruit slices, cheese or anything with 1 2 3 or ABC shaped cookie cutters. Even hamburger patties and mozzarella cheese slices for pizza can be cut out into shapes. Print out a large label that reads “Sunny Day …. Thanks for chasing the clouds away! Thank you for coming to _______’s Birthday Party!” and another label that reads “Cookie Monster Cookies” … add pictures or stickers of Sesame Street characters and then stick on the sides of small bags or boxes of chocolate chip cookies. Primary colored party bags with cut outs of letters and numbers made from scrapbook paper pasted to the side. On solid yellow paper bags paste the logo of Sesame Street that you print out from the computer or trace and make from scrapbook paper. Plain white square boxes with letters or numbers drawn on the sides to look like children's blocks.